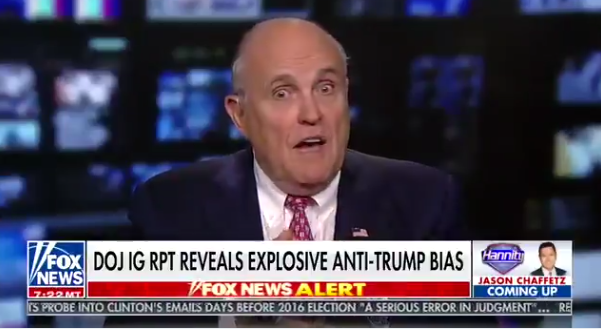 Giuliani: Robert Mueller Must Be Suspended [VIDEO] - Joe.My.God. Rudy Giuliani, President Trump’s personal lawyer, called Thursday for the suspension of Special Counsel Robert Mueller’s probe into alleged collusion between the Trump campaign and Russia in light of the release of a watchdog report that criticized key figures in the Hillary Clinton email probe. Giuliani, who appeared on Fox News’ “Hannity,” said the U.S. Department of Justice should dismiss all those in the “phony Trump investigation” and bring in FBI agents from the New York office to probe former FBI Director James Comey, special counsel Lisa Page and FBI Deputy Assistant Director Peter Strzok.